Potential last-ditch efforts to avert the worst impacts of global warming by geoengineering Earth's climate could themselves be harmful, a new study suggests. Why it matters: With global concentrations of greenhouse gases continuing on an upward trajectory, and no sign of the end of fossil fuel use — some researchers are turning to technological fixes for solutions to combating climate change. 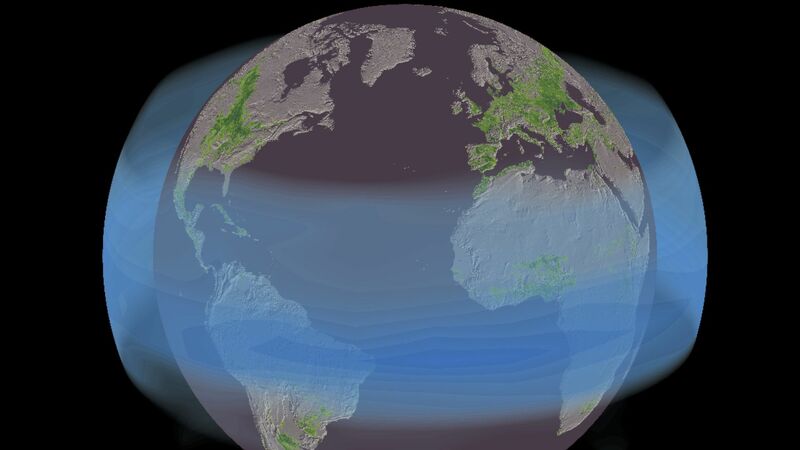 Geoengineering the climate is one solution being debated among scientists and policymakers. The new study underscores the potential unintended and unknown consequences of the technology, as well as the need to focus on more than just the temperature changes associated with global warming. Background: Right now, the world is on course to experience a greater amount of global warming than the 2°C, or 3.6°F, target under the Paris Climate Agreement. Scientists are studying whether the planet can be veiled in particles that would reflect incoming sunlight and offset warming of the planet. These solar radiation management (SRM) schemes are a type of geoengineering that would involve wrapping Earth in a "stratospheric veil." Groups at Harvard and other universities are focusing on taking geoengineering from the theoretical to the technically deployable stage during the next several years. What's new: A study published in Nature this week finds reason to be cautious about assuming that SRM would benefit crops by protecting plants from heat-related impacts and making sunlight more diffuse. The study relies on computer modeling that incorporates two large past volcanic eruptions — El Chichón in 1982 and Mount Pinatubo in 1991 — as an analog to SRM plans. Powerful volcanic eruptions can loft the chemical precursors to sulfate aerosols into the stratosphere. Mount Pinatubo, for example, sent 20 million tons of sulfur dioxide into the upper atmosphere, where it was then formed into aerosols. Such particles reflect incoming sunlight, cooling the planet down by reducing the amount of solar radiation reaching the surface. The study is the first to estimate how changes in sunlight from an analog to SRM would affect global crop yields. What they found: The damages seen during the mid-20th century from the way that sulfate aerosols scatter sunlight are about equal to the projected benefits to crops from cooling the planet. The net effect, then, would "attenuate little of the global agricultural damage from climate change," the study says. When Mt. Pinatubo erupted, sulfate aerosols were distributed around the planet and reduced direct sunlight reaching Earth by 21%. Diffuse sunlight increased by 20%. It also cut total sunlight by 2.5%, and cooled the planet by about 0.9°C, or 1.62°F. The study found that changes in sunlight due to Mt. Pinatubo had a negative impact on crop yields for all the crops examined in the study, including such staples as corn and wheat. This goes against the findings of studies that put forward the hypothesis —known as the diffuse scattering effect — that scattering sunlight could increase plant growth by distributing light more evenly across leaves. What it means: This study is one of many to come on the tradeoffs involved in deliberately tinkering with the planet's climate to offset the impact we're currently having on it. Some fear we may be compounding risks, rather than offsetting them. Yes, but: Researchers involved in the new study as well as in the geoengineering field in general cautioned that volcanic eruptions are an imperfect analogy for SRM methods, since they involve a one-time pulse of material into the upper atmosphere. In SRM, there would be a continuos dispersal of particles into the stratosphere, and the effects of the two might be different. Geoengineering researchers said the study is an important contribution to the relatively thin scientific literature on this topic, but that it has some flaws. "This is an important and impressive study," said Gernot Wagner, co-director of Harvard's Solar Geoengineering Research Program, who was not involved in the new study. "Scientists often point to past volcanic eruptions as reason to believe that solar geoengineering could work. Volcanoes, after all, have done something similar forever," Wagner said via email. Douglas MacMartin, an engineering professor at Cornell University who was not part of the new study, told Axios in an email that the results of the study indicate the need for further research. "It would be vastly premature to assume from this one study that the results will hold up after more research has been done. And, of course, this also illustrates the bigger observation that there is a lot we don’t know about stratospheric aerosol geoengineering, and given the possible consequences of climate change, we ought to be doing far more research to better understand it." Go deeper: We asked five experts about engineering the climate.